Planmeca Romexis® is the software of choice for modern dental clinics looking to take control of the digital revolution. 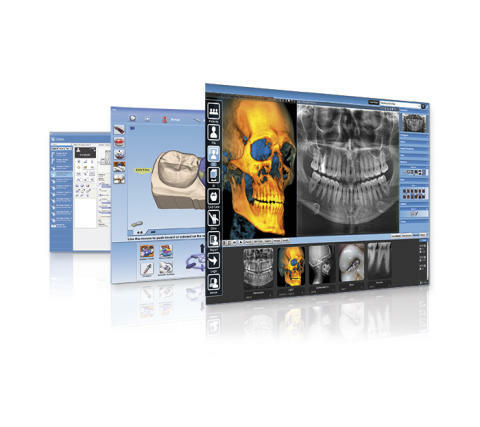 It is the most powerful dental ecosystem in the world and the only platform on the market to combine all imaging and the entire CAD/CAM workflow. The software’s extensive specialist tools, real-time monitoring possibilities, and unique connectivity with Planmeca equipment help make daily work more efficient and enjoyable for dental professionals around the world. The digital revolution has brought dentistry to an intriguing crossroads. As the field moves towards a completely digital future, it is of paramount importance that this already ongoing transformation remains as smooth as possible for dental professionals and patients alike. So how to proceed? What can dental clinics do to best position themselves for the era of digital dentistry? In a digital world, software is King. The ideal building block for any digital dental clinic is a comprehensive software platform, which is both powerful and reliable. It helps avoids the problem of scattered data and eliminates the need for separate software programs, which do not communicate with each other. A solid software platform provides all the tools required for successful treatments. The Planmeca Romexis platform consists of a collection of modules, which provide the perfect tools for specialist treatments. It is available for both Windows and OS X. Planmeca Romexis provides users with unique control of their digital working environment. All imaging and CAD/CAM data can be seamlessly accessed through the same interface. For CAD/CAM dentistry specifically, Planmeca Romexis presents a streamlined workflow that allows scanning, designing and milling to take place simultaneously. This enables unforeseen efficiency, as clinics can flexibly allocate their staff resources according to patient flow – ultimately treating more patients in less time. Planmeca designs and manufactures a wide range of state-of-the-art dental equipment that complements each other seamlessly. With Planmeca Romexis, clinics can directly upload patient data to a centralised database, as well as access patient information anywhere and anytime. The software’s clinic management module is also a solution no other manufacturer can offer. It is a networked solution, which allows clinics to generate valuable data on their digital Planmeca equipment for enhanced efficiency and quality assurance purposes. The module benefits both large and small clinics by providing real-time information and monitoring of unit usage and events. It is well established that digital dental equipment has the power to provide a great return on investment – as long as it is implemented seamlessly. With Planmeca Romexis software combining all device data and also offering extensive clinic monitoring and efficiency options, the future of digital dentistry is already here for those prepared to embrace it.